Sycpant Rhiw Parc – Rhiw Park Levels. These are two of the oldest levels in the Abertillery area. 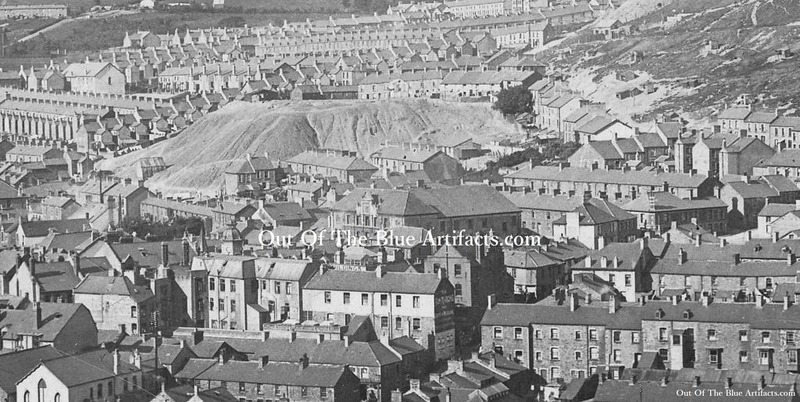 The image shows the Rhiw Park waste tip in the centre of the image and the town buildings and houses built around it. The Sycphant was more than probably owned by Mr Francis Adams. Mr Adams was an old inhabitant of the Abertillery valley and was a publican and coal owner. The Rhiw Parc/Rhiw Park Levels were situated just above the Rhiw Park area and was owned in the 1869 by Mr William Stewart later Manager of the Penybont/Tillery Colliery. This level was not listed on the 1880 list of collieries or after. The tramway from this colliery was in a straight line down from Rhiw Park, Division Street and down onto the railway where the Foundry Bridge was later built. The waste was dumped close to the entrance of the level across to James Street and upon the Rhiw Park area, later the tip was flattened and and a playground was built on it. During the Abertillery one-way traffic alterations and the re-routing of the roads in the town in 1983 the tip was partially removed and landscaped. It is still there today.